A rare insect that has killed tens of millions of ash trees in the United States is now active in Burlington County. On Dec. 14, Moorestown Township reported the emerald ash borer had been detected in some of the town’s ash trees. It is estimated in the next five to eight years, all ash trees in Moorestown may be dead, according to the township release. “Emerald ash borer is a fast-moving, highly destructive invasive pest, which could lead to the death of ash trees,” state Secretary of Agriculture Douglas H. Fisher said. The adult emerald ash borer is a metallic green insect about one-half inch long and one-eighth inch wide, making it hard to detect in the wild. The female beetles lay eggs on the bark of ash trees. The eggs hatch and the larvae bore into the bark to the fluid-conducting vessels underneath. The larvae feed and develop, cutting off the flow of nutrients and eventually killing the tree. EAB attacks and kills North American species of true ash, and tree death occurs three to five years following initial infestation. New Jersey is part of a federal quarantine to prevent the spread of the beetle, which prohibits movement of ash trees outside the quarantine zone. The department also recommends not moving firewood, which is a vehicle for movement of tree-killing forest pests including EAB. It was first discovered in Somerset County in May 2014. In a report from October, the EAB has been found in New Jersey in Bergen, Burlington, Mercer, Middlesex and Monmouth counties as well. “Now that the beetle is in New Jersey and is starting to spread, we ask that towns put plans in place to respond to the beetle,” Fisher said. While removing a dead tree, a Moorestown municipal employee discovered the infestation and confirmed it was EAB. According to the township-wide tree inventory, there are about 300 township-owned ash trees along the streets and in parks. It is unknown how many ash trees are on private property. The township is closely monitoring its ash trees to determine when and if the trees need to be removed. Township sites where trees are removed will be considered for replanting during the next planting cycle. The New Jersey Emerald Ash Borer website has many resources for municipal officials, woodland owners and residents. “New Jersey has formed a task force made up of officials from the NJ Department of Agriculture, NJ Department of Environmental Protection, Rutgers University and the U.S. Department of Agriculture Animal Plant Health Inspection Service. We have developed a website with helpful information that towns, homeowners and woodland owners can follow to manage this insect and ash resources,” said Joseph Zoltowski, the NJDA Division of Plant Industry director. Moorestown has set up information about the EAB on the Tree Planting and Preservation Committee website. The information includes how to identify an ash tree, how to identify that it has been infected and what are your options for treatment or removal. Check out the Tree Planting and Preservation Committee website on the right hand side for links at www.moorestown.nj.us/ 185/Tree-Planting-Preservation-Committee. “The options are limited once infected, but if you go on our website it lays out everything,” Township Manager Scott Carew said. Residents are asked to contact Public Works or members of the Tree Planting and Preservation Committee for help with identification and tree removal. Report signs of the beetle to the Department of Agriculture at (609) 406–6939. 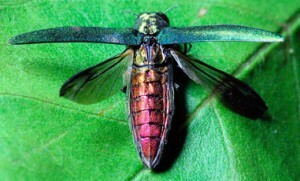 For more information about Emerald Ash Borer, visit www.emeraldashborer.nj.gov.